“A wedding is a day…a marriage is a lifetime.” Our parish follows the guidelines set forth by the Diocese of Orlando for the marriage preparation process. Contact our Marriage Preparation Coordinator for more information or contact the Parish Office. Please allow six months to complete the marriage preparation process. Click on the tabs to view the guidelines or begin the process below. Thank you! 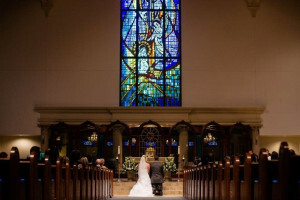 Music -All music for weddings is under the direction of the Director of Music and Liturgy. The music performed and sung will be by the Director and parish cantor. Guest soloists may perform but you must notify the Director of Music beforehand. Any additional musicians/singers can be hired for an additional rate per musician. Please contact the Music Director to arrange for this. For stipends required, please see the wedding worksheets. The wedding worksheets for the music, liturgy, and wedding party information are to be turned into the Marriage Preparation Coordinator at least 4 weeks prior to the date of marriage and no changes or additions can be made less than a month before the date of marriage. Please see our parish website for the listing of music selections. Mass or Ceremony– For marriages in which the bride or the groom are non-Catholic, it is suggested that the wedding be celebrated as a Ceremony. If both parties are Catholic, the wedding may be celebrated as a Mass or a Ceremony. The difference between the two is the Celebration of the Eucharist. If the wedding is celebrated as a Ceremony, the time is only approximately 10-15 minutes shorter than a wedding with a Mass, which normally last about an hour. If there is a special tradition you would like during your wedding ceremony, i.e. cords, coins, etc. please note this on the wedding worksheets. Wedding Rehearsal– The rehearsal allows members of the wedding party to become familiar with the environment and the specific roles they will assume in the ceremony or liturgy. We ask that only those who are participating in the liturgy, i.e. entire wedding party, readers, parents, gift bearers, flower girl, ring bearer, ushers be present at the rehearsal. Due to the high probability that several rehearsals may be scheduled on the same evening, please be on time. Our parish provides a bridal consultant/sacristan who will assist at the rehearsal and direct the wedding party at the time of the ceremony along with the presider. If you have a marriage coordinator, they may attend the rehearsal, but please keep in mind that they have no responsibilities in the church, at the rehearsal, before or during the ceremony. You must bring your marriage license, stipends, and guest book to the night of the rehearsal. Our parish does not provide or rent out space for rehearsal dinners and/or wedding receptions. If you wish to have a program for your ceremony, this is done on an individual basis as the parish does not provide this. Flowers– One floral arrangement may be placed in front of the altar or two small arrangements can be placed on either side, but not on top. We do supply pedestals if needed; they are 24”, 36” or 48”. Pew decorations are not permitted, i.e. pew bows. During the season of Lent, all arrangements must be removed from the church immediately following the ceremony. Please designate a responsible party to take care of this. Flowers girls are not permitted to drop any materials on to the floor during the ceremony and rose petals may not be thrown inside or outside of the church due to risk of an injury. Photography and Videography– Photographs may be taken 30 minutes prior to the ceremony and 30 minutes immediately following the ceremony. Photographers may not interfere with the liturgical action of the wedding celebration in any way. Aisle Runners– Aisle runners are not allowed due to the risk of injury. There is a center aisle and it is approximately 63’ long. Advent-Weddings celebrated during Advent will have a purple and pink altar cloth and ribbons. The Advent candles will be present in the altar area. Lent-Weddings celebrated during Lent will have a purple altar cloth throughout the altar area. There are no floral arrangements in the church for Lenten Sundays; therefore, you must make arrangements for your flowers to be removed after the ceremony. The altar area will also be decorated accordingly. Thanksgiving- The altar area may be decorated with fall colors and liturgical enhancements for the season close to the holiday. Christmas-Weddings celebrated during the Christmas season will have a white (cream) altar cloth, traditional Christmas colors, a cresch, garland, trees, and poinsettias throughout the altar area along with any other liturgical decoration. Easter-Weddings celebrated during Easter will have a white (cream) altar cloth and spring colors. A gold cloth will also be draped throughout the altar area. Ordinary Time-The altar area will have a green altar cloth that may change to white or red depending on special celebrations. Bridal Room– A holding room is provided for the bride and her attendants prior to the ceremony for last minute grooming, but please be advised that it is not a dressing room. It is also recommended to designate someone to collect belongings and to remove them from holding room prior to ceremony. Dress Code– We ask that all dresses to be modest in taste and style and for the bride to please keep in mind the reverence for the church and priest and the sanctity of the Sacrament. Dresses should not be low cut or inappropriate. Altar Servers– One altar server will be required for all weddings. We have and will provide a specially trained server for your wedding. Receiving Line-If you insist on a receiving line after your ceremony please be aware that it will limit your picture taking time and you will not have the full 30 minutes after for pictures. It is advised to do this at your reception site. *You MUST be on time to rehearsals and it is mandatory that the wedding party and bride/groom arrive no less than 30 minutes prior to the scheduled time of the marriage. **There are absolutely no alcoholic beverages, gum, or food items allowed in the church at the rehearsal or during the ceremony. ***Bubbles and the throwing of rice, birdseed or confetti are prohibited on the church property after a wedding ceremony. Please save this for your reception site. ****Please remember that the church is here to assist you in the Sacrament of Marriage and we ask that you show the utmost respect for the church and follow the rules and guidelines we have provided for you here. We greatly appreciate your assistance in this matter. 1. A meeting with a Priest and the Marriage Preparation Coordinator. A wedding date cannot be scheduled until the engaged couple has met with the marriage preparation coordinator. It is our policy for the Priest to meet with the couple several times before the scheduled wedding date. The Church asks that appropriate time be taken for marriage preparation. The engaged couple should contact the church office at least six months in advance of their proposed marriage date. All paperwork will need to be finalized at least two months before the marriage. 2. If there has been a previous marriage(s) (Catholic, non-Catholic, or civil) an annulment(s) must be completed before a date can be set for a marriage. 3. The FOCCUS process is designed to help couples learn more about themselves and their unique relationship. This communication inventory is administered to an engaged couple by a married facilitating couple of the parish to enhance communication, understanding and reflection upon one’s own values. This valuable tool helps the engaged couple to clarify any issues that may arise before marriage. 4. The Beloved Series explores the true meaning of Marriage and how to live it out together. Here you’ll discover the deepest spiritual, emotional and practical realities of Marriage through Scripture, Tradition and Church Teaching. You’ll see first-hand how to experience the wonder, mystery and joy of this Sacrament – from that first “I do” through the rest of your lives. It is mandatory for all couples who wish to marry here and it is a 7 week course offered twice a year in the Spring and in the Fall. 5. Completion of all paperwork, stated in the section Required Documents. When all requirements have been met, the actual planning of the wedding ceremony can begin. All questions pertaining to the paperwork should be directed to the Marriage Preparation Coordinator and all questions pertaining to the wedding music should be directed to the Director of Music and Worship. The Marriage Preparation Coordinator will complete the Diocesan pre-marital questionnaire (Form A) with each couple at the initial interview. 1. Form B’s-The bride and groom will each receive two witness affidavits. The forms verify their freedom to marry. Each form will need to be completed by a parent, a sibling, a relative, or by a friend who has known the couple for two or more years (by four separate people). These forms will need to be notarized. 2. Baptismal Certificate-If Catholic, you will be required to obtain a recently issued baptismal certificate from your Church of Baptism dated within 6 months of your date of marriage. If non-Catholic, a certificate of baptism is also required. A copy of the original certificate is acceptable only for a non-Catholic party. 3. Confirmation Certificate (if applicable)-This can be obtained from the church where the Sacrament of Confirmation was received. 4. If there was a previous marriage(s), church or civil, a “Decree of Nullity” will be required along with the certified divorce decree and a copy of the marriage license of the previous marriage. If previous spouse is deceased, a copy of the death certificate will be required. 5. If under the age of 19, a written and notarized parental permission is required and the couple must adhere to Diocesan rules for youthful marriages. A Pre-marital counseling session will also be a requirement. 7. The marriage license must be brought to the night of the rehearsal. This is obtained from the County Clerk’s office prior to the rehearsal. A tentative wedding date can be set when the engaged couple has completed the initial meeting with the Marriage Preparation Coordinator. However, the date is not final until all requirements have been completed. Any date or time changes need to be brought to the attention of the Marriage Preparation Coordinator who will be making the wedding arrangements for you. Marriages are celebrated on Saturdays at 10 am, 12 pm, and 2 pm and on Friday afternoons subject to availability. Rehearsals are scheduled for 5, 5:30, or 6 pm the evening before. Please keep in mind that all times are subject to availability. Please remember that there are many weddings throughout the year at our parish. If you have reserved a day and time for your wedding and you need to change or cancel, please notify the Marriage Preparation Coordinator as soon as possible. Any additional musicians/singers can be hired at an additional rate per musician of $100. Please contact the Music Director to arrange for this. The stipends are due at the time of the rehearsal. Please bring in separate envelopes along with your marriage license. Thank you!